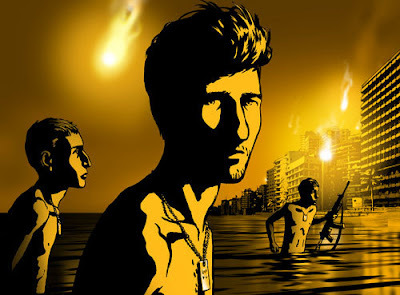 The Festival has the good fortune of screening Ari Folman's Waltz with Bashir as one of this year's Gala Presentations. The film received six awards from the Israeli Film Academy-- including Best Film, Director, and Screenplay--as well as critical acclaim from festivals around the world. 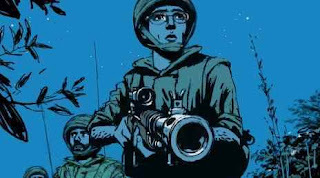 As an animated war documentary, from the outset Waltz With Bashir operates on intriguing ground. After all, documentaries are supposed to at least tip their hats to that murky, malleable concept of objectivity, so why the cartoon medium in this business of uncovering truth? This film makes these somewhat contradictory modes of form and genre work in a strange kind of tandem by which animated images, the film medium, dreams, individual and collective memory (or amnesia), and history all come under interrogation. Folman's findings show these soldiers' pasts, Israel's past, and--by explicit extension--all stories of war as mediated and re-mediated. Venturing through (and learning from) the layers of emotion, through the clouding forces of time, through attempt after attempt at self-preservation, through the mind's purposeful gaps and holes in its powers of repression, leaves Folman and all of us at last staring at the overwhelming and revolting truth--at least a far less mediated version of it. An Israeli veteran from the 1982 war between Israel and Lebanon, Folman opens the film with his realization that he has virtually no memory of the war and thus ventures on a personal and cinematic quest to uncover what actually happened. 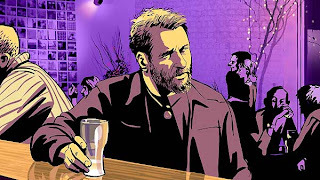 On this point, Waltz with Bashir embarks on the kind of fact-finding missions of more traditional documentaries and halts on familiar questions of post-war reflection, namely, who and how did I hurt. He interviews classmates, other soldiers, the first Israeli reporter on the war, and his best friend who also happens to be an expert in post-traumatic stress disorder. Slowly, the pieces start to come together around the Sabra and Shatila Massacre, an astounding incident that left thousands of Palestinians dead by the hands of Lebanese Phalangist militiamen and by the acquiescence of Israeli forces. And so, Waltz with Bashir manages a difficult harmony of elements. The animated image pulls us into personal dream worlds that, side by side with interviews and bits of historical exposition, compose Waltz with Bashir’s truth, a truth which lies both in the hidden intimacies of one man’s memory and in the assertion that universally, war is hell.